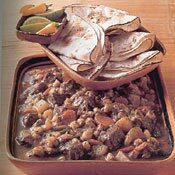 RECIPE TITLE "New Mexico Beef Stew with Green Chiles and Posole Recipe"
This classic Southwestern dish is traditional fare during the fall, especially for family gatherings and holiday season celebrations. The long green chiles grown in the Rio Grande Valley in the southern part of New Mexico, especially around Hatch, are among the most flavorful in the world, and with a medium heat, they are popular in many regional recipes. Posole is the Spanish name for field corn that has been treated with slaked lime to remove the tough outer layer of the kernels, similar to hominy. Posole is also the name given to a stew made with pork and posole corn, but beef, lamb, and goat work equally well. Serve this stew with warm flour tortillas, fresh crusty bread, or corn bread. TO PREPARE STEW: Heat 2 tablespoons of the olive oil in a large saucepan or stockpot. Place the flour in a shallow bowl or on a large plate and season with salt and pepper. Dredge the beef in the flour, add half to the saucepan, and sear over medium-high heat for about 5 minutes, or until browned on all sides. Remove the beef from the pan with a slotted spoon. Heat the remaining 1 tablespoon of olive oil and repeat for the remaining beef. Add the first batch back to the pan when the second batch has cooked. Add the beef stock, water, and wine, and bring to a boil. Add the posole, onion, garlic, and green chiles, and return to a boil. Reduce the heat to a simmer and add the cumin, oregano, salt and pepper. Cook, partially covered, for 1 1/2 hours, stirring occasionally. Add the potatoes and carrots, and continue to cook for 1 hour or until the potatoes and posole are tender and the kernels have opened up. Add a little more water if necessary to keep the consistency soupy, and adjust the seasonings as necessary. WINE RECOMMENDATION: This stew demands a wine of strong character as well. The Rhone Valley of France provides just such wines: Chateauneuf-du-Pape, Gigondas, St. Joseph, and Hermitage are all good choices. HELPFUL TIPS: You can use dried posole in this recipe, but the stew will take up to 5 hours to cook. If using dried posole, add the potatoes 1 hour before the stew finishes cooking. If posole is unavailable, use canned (precooked) hominy. Rinse it well and add 15 minutes from the end of the cooking process.